Stop what you’re doing: Meghan Markle and Kate Middleton hugged today, and you need to see it. Seriously, this is urgent news. How else are you going to believe these two aren’t feuding? Never mind that Kensington Palace publicly shut down this rumor a few months ago. Oh, if you don’t know what I’m talking about, here’s a quick refresher: Toward the end of last year, stories began circulating that Middleton and Markle didn’t exactly have the warmest relationship. There was no basis to these reports—just anonymous royal sources—but they were weighty enough to warrant a documentary special, Kate v. Meghan: Princesses at War? Markle and Middleton aren’t even princesses! Even though it’s 2019 and we logically know these two grown women have more important things to do than hate each other, the feud rumors persist. But wait: Now they’re hugging, which means people have to believe there’s no drama. The embrace seen ’round the world happened Monday, March 11, during a Commonwealth Day service at Westminster Abbey in London. 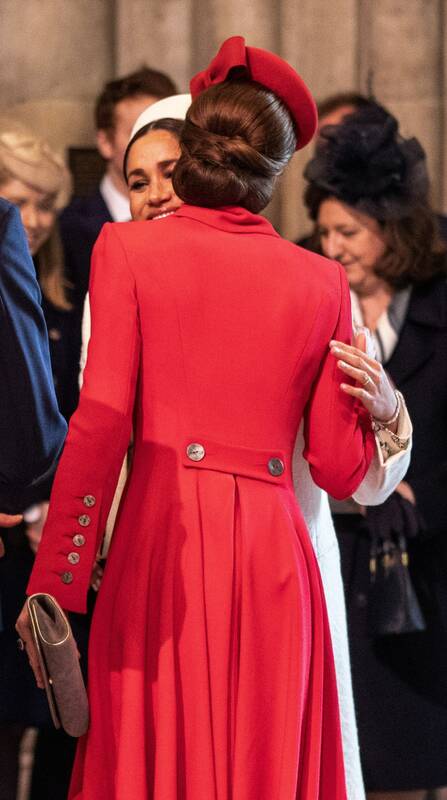 Middleton arrived to the event after Markle and greeted her with a hug and what might even be a kiss on the cheek. Whoa! Markle wore a cream-color Victoria Beckham dress for the occasion, while Middleton wore a gorgeous red coat by Catherine Walker. Markle’s face here says it all—and by “all,” I mean, “Yes, this is my sister-in-law with whom I have a normal, healthy adult relationship.” That’s what I think, at least. Markle has a child on the way, people. Do you think she has time to worry about shading Middleton? And the same goes for Kate Middleton. No, she’s not pregnant, but she’s Kate Middleton! She’s too good for petty feuds—as is Meghan Markle. Let’s hug it out with these rumors and move on.